Before you get all excited, this is just a reproduction of the original GA-01 that was offered as a prize item from Banpresto. While it is not the original item, it is a great opportunity to talk about some of the history behind this legendary gokin, the one that started it all. Back in 1972, Japanese toy maker Popy was having a bit of success with merchandise from its live action shows like Kamen Rider when it decided to first use Zinc Alloy (aka Diecast) in making small vehicles seen in the shows. The resulting toy line was known as Popynica (a combination of Popy and Mini-Car) and was the first Popy product to use the now legendary numbering system. 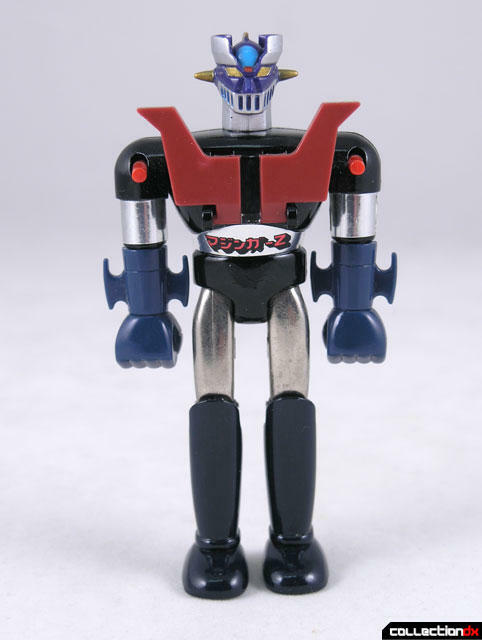 It was during this time that Popy got the license to manufacture merchandise from a new cartoon called Mazinger Z. 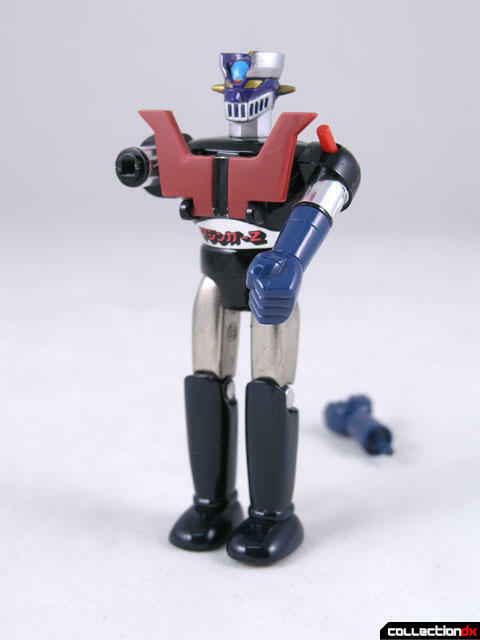 Developed from a manga, Mazinger Z had been capturing the minds of children everywhere. In order to replicate the feeling of the giant robot, Popy created the Jumbo Machinder line of 24" polyethylene robots. The Jumbo was a huge success, and Popy was about to hit on another. Lead designer Katsuhisa Murakami was brought in to create another toy concept. If the Jumbo represented size, what would represent weight? 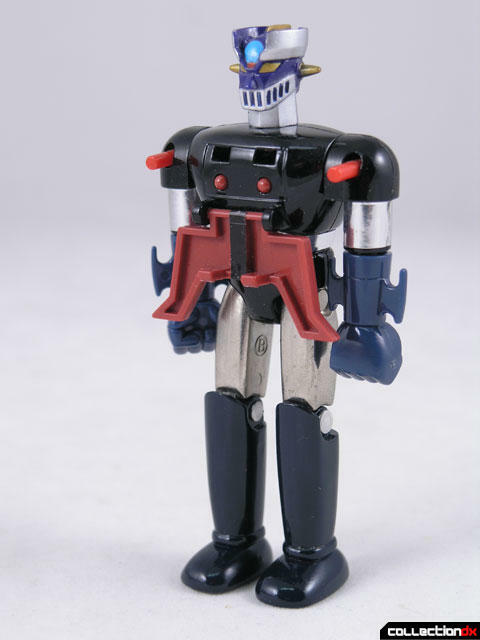 In the anime, Mazinger Z is made out of a fictitious metal called Cho-gokin (literally, "Super Alloy"). 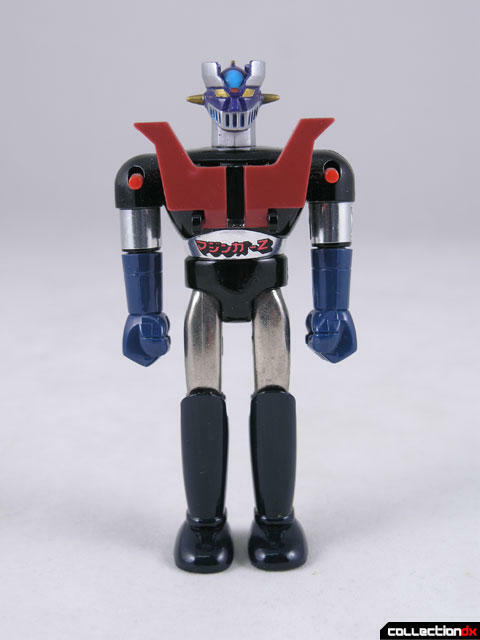 Murakami decided that creating these new toys out of the diecast used in Popynica toys and branding them "Chogokin" would be a hit with kids, thinking their toys were made out of the same metal as Mazinger Z.
Murakami was right, and the rest is history. 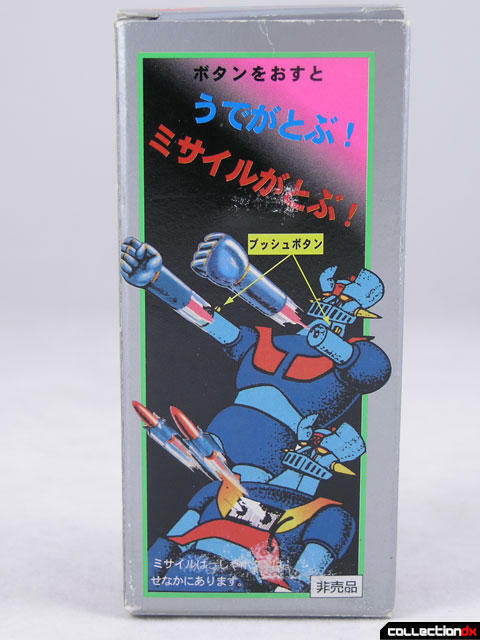 The Chogokin Mazinger Z was dubbed GA-01, and sold like crazy. So much so that they continued to refine and execute the design, resulting in four original versions of the GA-01 and countless repaints and reissues. This design is why we are here today. Why my childhood was what it was. Why this website exists. Of course, being the first Chogokin, finding a mint condition example can be a rare and costly affair, costing thousands of dollars. 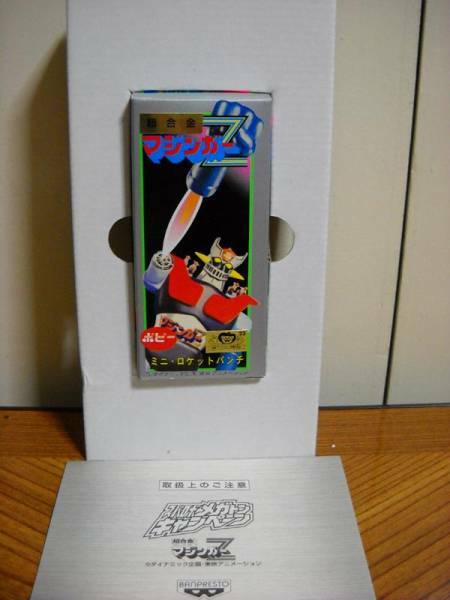 In 1999, Banpresto decided to reissue the GA-01 and offer it as a prize item to be given away when customers sent in coupons from a select Super Robot Wars video game (Super Robot Wars F Final). Banpresto needed a GA-01 to reproduce, and since the molds had long since deteriorated, looked to collectors to find a mint specimen. They eventually got one from Koji Igarashi, author of Green Arrow Graffiti, and another from Kazunori Saito, legendary collector and publisher of several guide books. It is from these collectors that Banpresto got their template for their version of the GA-01. According to this article on Toybox DX, the Banpresto version is pretty close to the original, aside from the markings on the feet and the firing mechanism on the back. A comparison of the original versus the reissue can be found here. Like the original, this version features folding down chest plates with launching missiles. Included are regular fists and iron cutter fists, both launch with the press of a button on the shoulders. The toy comes in a reproduction box, complete with paperwork, foam padding, missiles, and two kinds of fists. The reproduction box came shipped in an outer Banpresto box. A black version was also offered, and is harder to find than this one. This reproduction can be easily found for under $100 on various sites, and is a great stand in for the real thing. I had no idea that they made SOC commercials, or is this the first one? If they made a bunch of them with the toys animated like the old ones, that'd be sweet.. This is really cool. How tall are the GA-01 toys? I take this is a little bigger than those mini-Shoguns, right? When looking for the Banpresto reissue on eBay or whatever, is it still GA-01? Like Banpretso GA-01 or something? Nice write up , Josh. Every body into robots needs one. And sure, an original would be awsome to own, but seriously, it can't be any better of a toy than the reissue, especially for a collection. The reissues found will be nice and shiny new. DAPDX, this guy is 4 1/2 inch (11.5 cm), and stuffed pretty tight into a tiny box not much bigger than he is. Depends on the month, how sellers describe it, but rarely will be listed under Banpresto. Usually just "chogokin Mazinger" will find it. Heh...I just scored this beauty from the "Harkavy Estate". Awesome little piece, and the perfect companion to the version 5 GA-01 that Banpresto released years ago. From what I'm told, the only thing to keep in mind with this version is that the replication of the first version GA-01 was so good, they actually replicated it's *flaws*! The spring-loaded fists/shoulder launching mechanisms were apparently very delicate on the original toy, and those design flaws were carried through in this replica. Hmmm... awesome write-up. I really need a GA01 of some variety myself. The history lesson at the beginning is awesome as well... I hadn't realize that the Machinder came before the Chogokin. 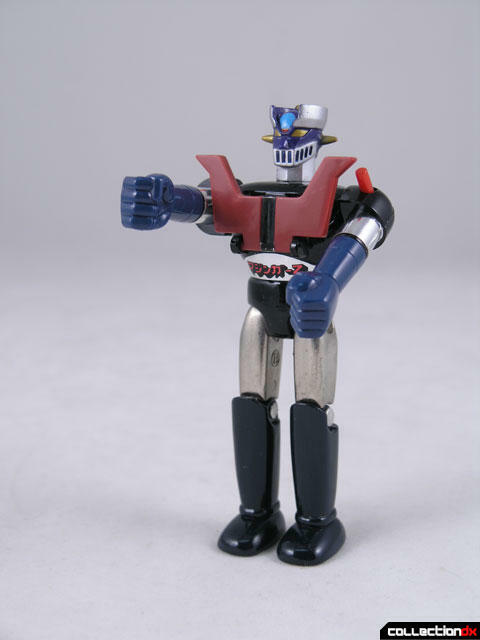 Maybe I should get a U5 Mazinger Z as well! Can I inquire as to what stores are most likely to have this? I found one on ebay but lost the auction. I'd really like to own one of my own. It definitely should be the starting point for any robot nerd collection. Mine is underway but it lacks that distinctive link to the past. Your best bet is to continue to troll eBay for one. They come up often enough. I mean, ya could grab one from Y!J...you may even save some cash...but unless you have a bunch of things coming from your "agent" that you can tuck this in with, I'd stick to eBay. I've seen a bunch of Chogokin commercials and some are currently floating in my mind. 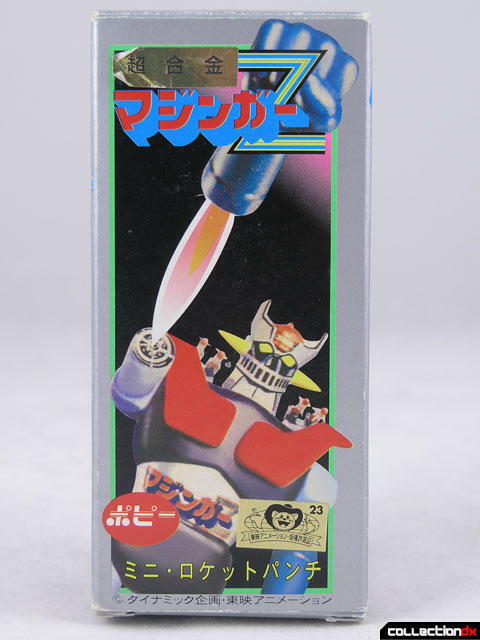 But well, never seen a SOC commercial before, I've watched Tranzor Z (the American translation of Mazinger Z) when I was a kid. Thinking like a 70s kid even though I've never born in the 70s. If they kept making more of these ads, I would say "even kids want them now! ".